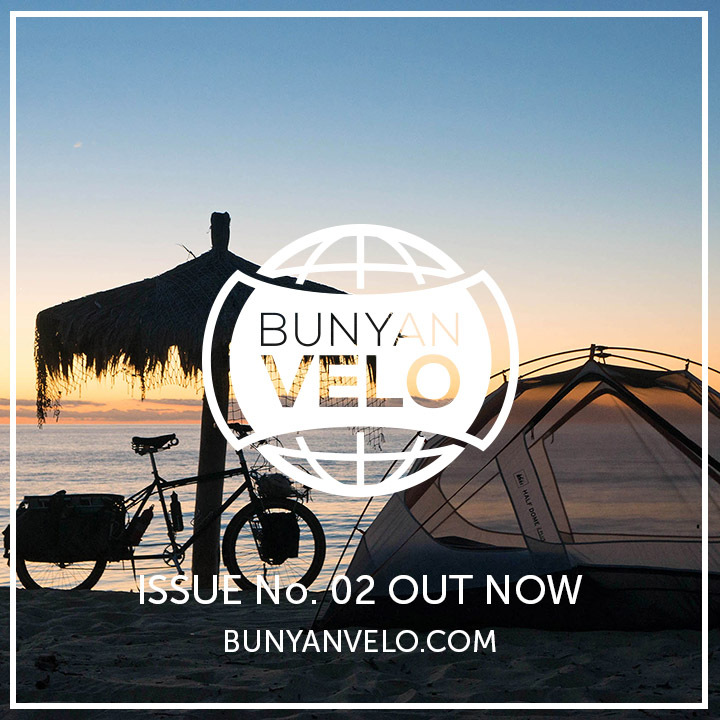 Bunyan Velo Issue 2 – just out! There’s a new issue of Bunyan Velo in town! If you enjoyed Issue 1, you’ll be delighted to hear this latest instalment features more of the same vein in storytelling – a diverse and photo-rich collection of 14 tales spanning the globe, from wintry Alaska to jungly Rwanda, handsomely bound together by editor Lucas Wizenberg. Despite the undeniable elegance and quality of the publication, these are real, honest, down-to-earth stories that will have you reaching for your bicycle and camping gear – as such, they’re a refreshing change from the gloss and glamour of many ‘adventure’ magazines. And, like last issue, it’s online and free – with the option of downloading a PDF for a just a few greenbacks – a nominal fee that will help ensure this wonderful endeavour continues to flourish. This issue, I had the pleasure of contributing a short piece on the quandaries of the digital nomad. It joins articles by the likes of Joe Cruz, Glenn Charles, Amaya Williams and many more. Click here to get reading Bunyan Velo, Issue 2. This entry was posted in Journalism on May 29, 2013 by Cass Gilbert. Thanks for the heads up;) Great reading!!! Read your article in Bunyan Velo. Looks like Shell Ridge, but I was intrigued with your comments about “plugging in,” as in all the electronic gizmos and the use of social media. I just returned from 4 days camping where my iPad ran out of juice. I’m wondering if you could do a post about what you take (i.e., computer, camera, etc.) and how you keep it all charged? Love your blog and especially the photos. The first picture was in the Marin Headlands, the rest was indeed Shell Ridge. Sometimes I do feel a bit shackled to electronics. Since my first big tour, in 1998, I’ve kept a website, and then various websites and blogs in the interim. Back then I took slide photos and scanned them when I could. And I had a tiny device called a Psion MX5, that ran off 2AA batteries. It had a (by current standards) puny 16MB internal memory, and I had a 16MB card for backups. (now, I have a 16GB card!) Sporadically, I attempted to try and link it with an Erikson phone and send emails. Or, hook up the MX5 to an internet cafe computer and try valiantly to export files by typing in a bunch of code. It was cutting edge stuff! Anyway, I don’t actually have too many issues keeping gizmos juiced up now. I’m currently using a Canon 5Dmk2, mainly with a 40mm 2.8 lens. The battery life is so good that I’ve never run out before reaching somewhere I can charge it. I had a spare battery, but have since lost it. It’s a big camera, but it’s what I have and I really like it. I also have a Panasonic GH2, but I’m down to just a couple of lenses on that one – my favourite being the 20mm, which becomes a 40mm when the crop factor is taken into account. I’ve got my eyes on a new generation mirrorless camera, but I’m holding back for now. I recently invested in an iPhone 5, and use a Goal Zero solar panel to keep it charged up, which works pretty well here in New Mexico. It’s the older version of this one. However, now that I’m using the iPhone as my GPS (I also have a Garmin Etrex 20), I’m looking into ways of rigging up to a front hub dynamo, as the GPS really saps the battery. Additionally, I have a Macbook Air, but I generally just use that in cafes/hostels, rather than when I’m camping. Before I head back to Peru, I’ll most likely make some changes to my gear, so I’ll do a more thorough post then! Marvelous magazine! One of the many good things about it are that the articles are not strangled by too much advertising, Quality, through and through. Hope this magazine will have a long life..it deserves it! Kellie, You can buy a solar charger which can also be pre- charged at home from AC if you are expecting cloudy conditions.. Plug into your iPad on the road to re-charge. I use a Powermonkey but there are lots of other brands. You can just plug in the battery part of the kit to re-charge overnight while you are sleeping. Steve, I’ve looked at the Powermonkey. How do you like it? I’ve been wrestling with the idea of just an external rechargeable battery pack which can charge everything; phone, iPad and GPS (like the Gomadic, interchangable tips, 3400 may) versus a solar model. I too take my DSLR and like Cass says it’s battery lasts quite a while. Pros cons between the two? Glad you enjoyed the magazine. I think Lucas Wizenberg, the editor, has done a fantastic job gathering all the material together, and laying it out so elegantly.